Welcome 2019! 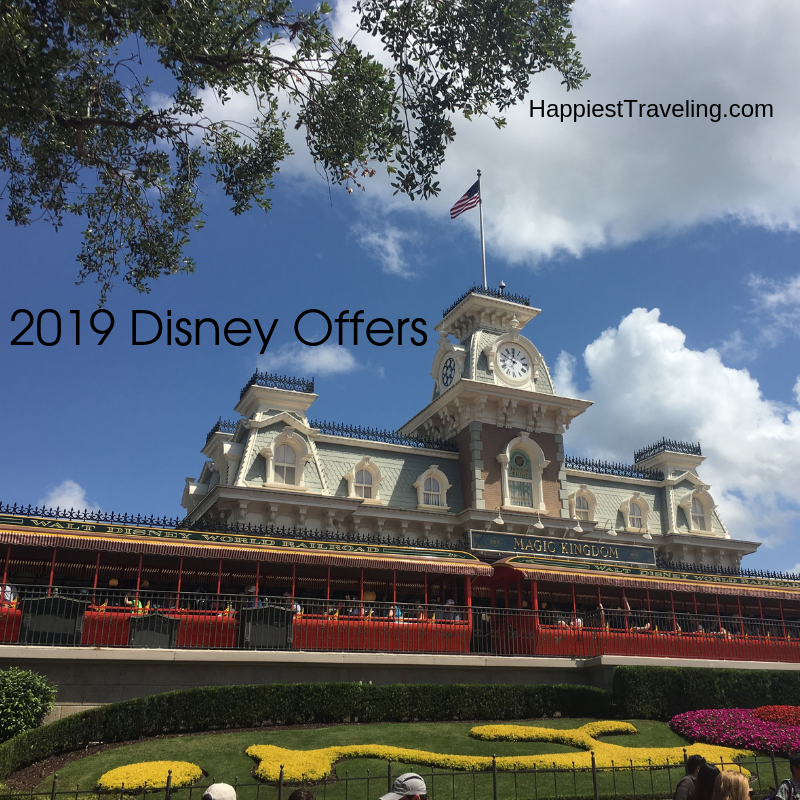 It’s a good year to head to Walt Disney World, especially if you want to take advantage of offers Disney has released for the beginning of the year. This is to encourage people to plan their vacations before the late fall opening of Star War’s Galaxy’s Edge – which is going to break records for attendance and you may not want to be in the middle of the madness. 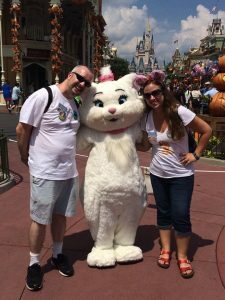 Hi, I’m Richard, and I’m here as a “guest blogger” to talk about the Disney cruise to Alaska my wife Erica and I took September 4-11, 2017. 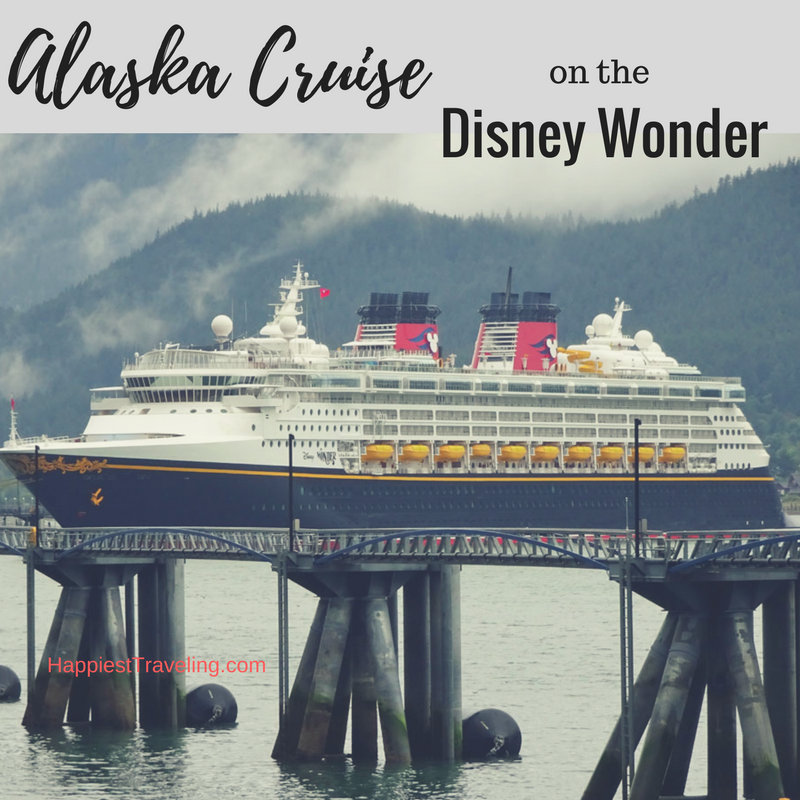 I know that many of you have been on a cruise, even maybe a Disney cruise, but not too many have been on a Disney cruise to Alaska…so I thought a discussion of each aspect of the cruise would be helpful! It’s no startling revelation at this point to say that my wife and I are HUGE Disney fanatics. If we’re away from the parks for more than a few months we start to get antsy and are itching to return. But that’s not to say that we don’t enjoy doing other things as well. And, in fact, our love of Disney lead us to one of our new passions: CRUISING! 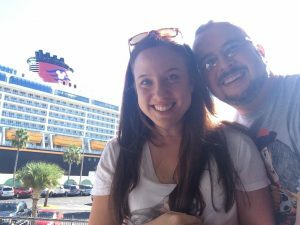 Our main motivation for our first cruise was because it was, surprise, a DISNEY cruise. We were excited for all of the unique Disney experiences on board, but we probably weren’t prepared for how much we would like cruising in general. 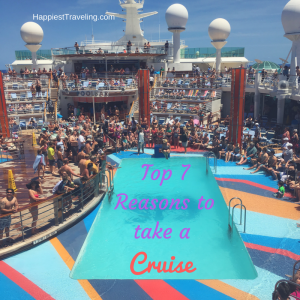 I’d recommend taking a cruise, of any kind, to ALMOST anyone. I say “almost” because let’s face it, if you don’t like water, or food, or have motion sickness, it’s just not going to be for you. 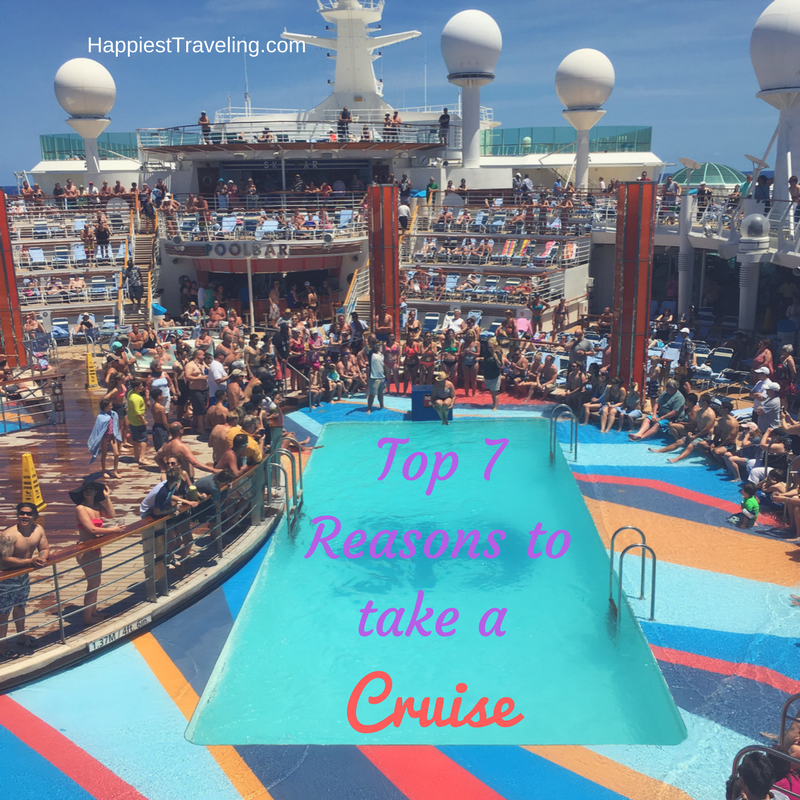 So, without further ado, here are my Top 7 reasons that you (yes, YOU) should go on a cruise vacation! While I don’t consider myself a super-collector when it comes to autographs, I have started obtain a nice little collection of celebrity signatures. I’ll write more in-depth later about chasing wrestlers and other minor celebrities at various conventions. That’s definitely a blog post in itself. But, this post is going to be a little bit different….. 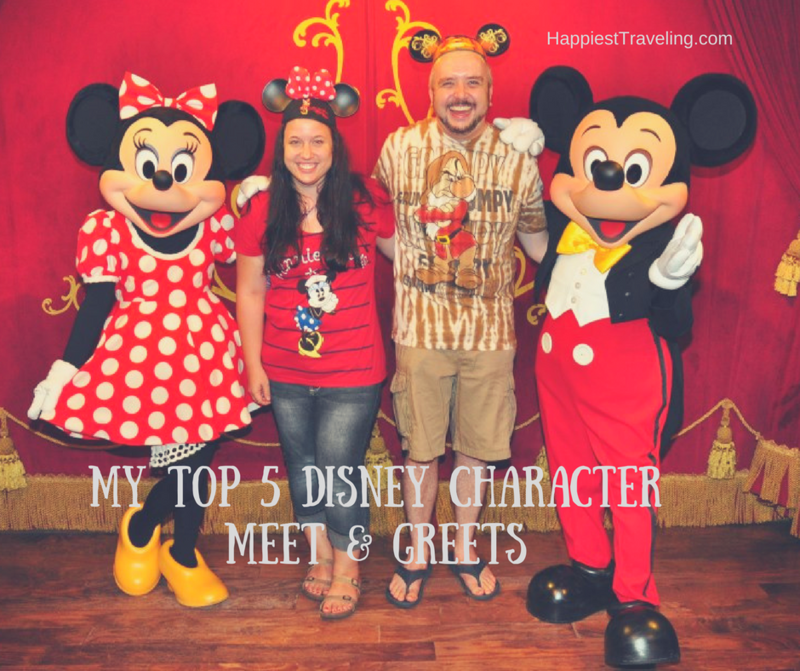 When my wife and I first started going to Walt Disney World on a regular basis, one of our favorite things to do, as mentioned in a previous post, became getting our photograph with the glut of Disney characters on hand. Nobody should leave Disney without at least ONE character photo and interaction (if only one, it has to be Mickey Mouse, right? ), but it has become a bit of an obsession to meet as many different characters (in as many different outfits) as we can. Despite the fact that I am well into (further than I’d care to admit) adulthood, one of my favorite things about the Disney experience is meeting the costumed characters representing our favorite Disney “stars”. That’s the point, right? We all want to dive into the Disney bubble and feel like a kid again, and this is one of the best ways to achieve that goal. 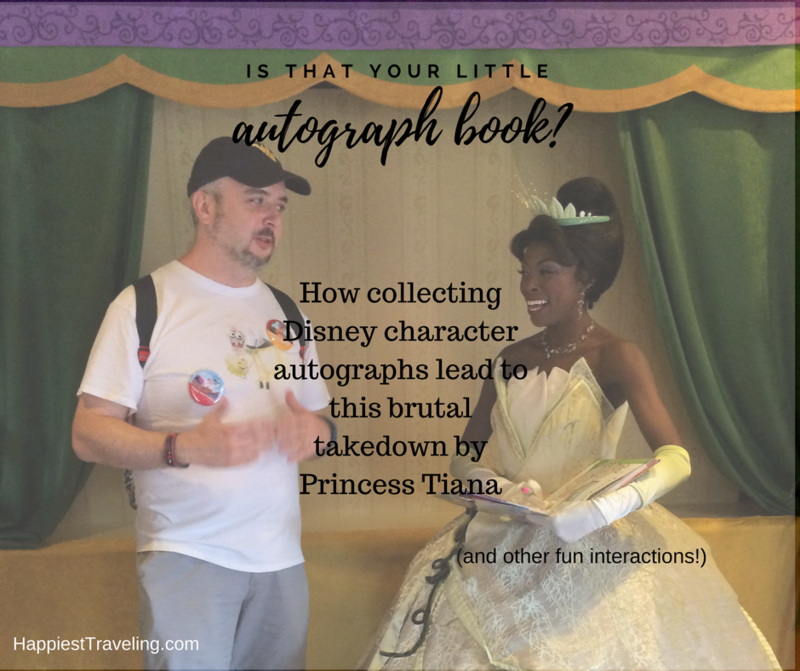 My wife and I, throughout our many trips to Disney World, have become pretty serious “character collectors”, so to speak. “How does one collect characters?”, you may ask. Well, please don’t jump to any weird conclusions, you will not see us stuffing Mickey and friends into the back seat of our car. Our Disney obsession does not extend to mouse-napping! 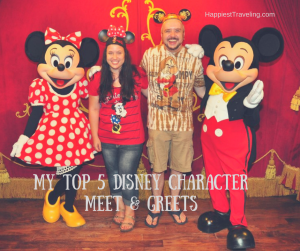 “Character collecting” is simply a figure of speech, which means we will go out of our way to meet any characters we haven’t previously met, or to get a photo op with classic characters in a new outfit. While finding new characters for photo ops can become increasingly difficult when you’ve made as many trips to Disney as we have (poor us, huh? ), there are some that we have to meet every single time. 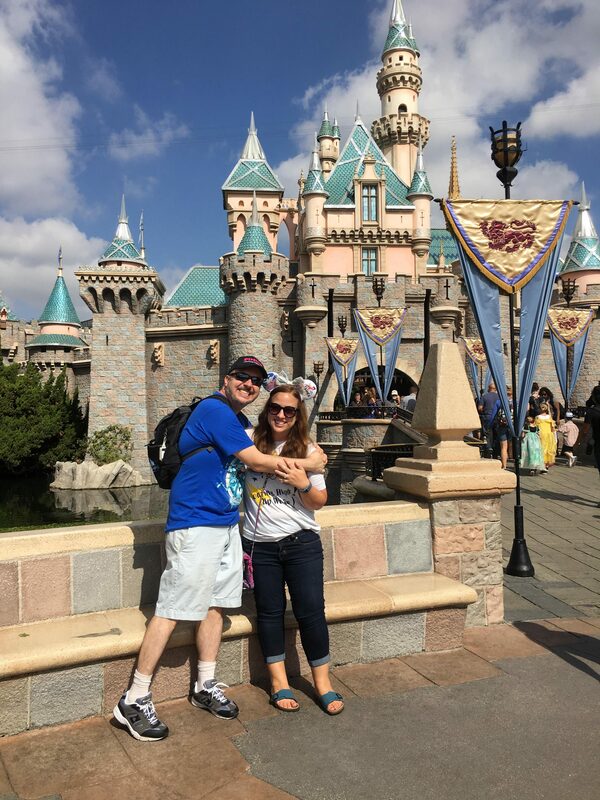 For our first post on Happiest Traveling, we thought we would talk about why we love Disney vacations so much. After all, we’re a *cough* middle-aged couple without kids. Why do we devote so much of our hard earned vacation time and money to the mouse? Gary’s up first. 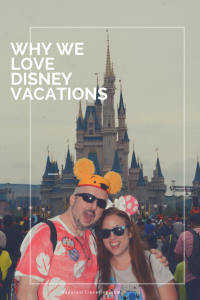 Why do I love Disney vacations? That question can mostly be summed up in three simple words: “The Bubble Effect”. If you don’t know what the “Bubble Effect” is, it’s pretty self-explanatory. When you’re on Disney property, particularly Walt Disney World in Orlando, Florida, you literally FEEL like you’re in a bubble. The outside world, with all of your worries and responsibilities, disappears. You can go for miles on Disney property and not see a gas station, a convenience store, or even a chain restaurant (unless you count the one McDonald’s on property to keep the kids happy). You really do feel like you’re millions of miles away from your normal, everyday life. The Orlando Disney experience particularly gives this vibe because of the huge amount of property that is encompasses. You could literally make a whole vacation out of just touring the resorts and restaurants on property and never once set foot in one of the four main parks. Of course, to get this full “bubble” experience, you have to actually stay on Disney property. When you’re in their “world,” for however long your stay happens to be, you really never have to leave. Though it’s completely permissible to use your own vehicle to travel from park to park, you can also use Disney buses to move from resort to park, park to park, or park to resort. Nervous driver like me? No problem. Once you’re in the bubble, you don’t HAVE to drive at all. With all of that being said, it is nice to have that freedom if you desire to make your own way from attraction to attraction, but knowing you don’t HAVE to do that takes a lot of weight off your shoulders. Is being inside the Disney “bubble” the only reason to visit Walt Disney World? Of course not. While I fully believe anyone can have a blast there with a properly planned vacation, it certainly helps if you open yourself up to enjoying all of the magical experiences Disney has to offer. I personally, though, wouldn’t have nearly as much fun at PGA World, or Grey’s Anatomy Land, or…………well, you get the idea. I love Mickey and his friends, and that’s a big plus when being completely surrounded by all things Disney. To sum things up, go for the bubble………stay for the magic. 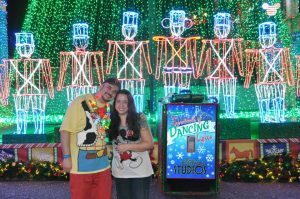 Gary and I decided to go to Walt Disney World and Universal Orlando for our honeymoon in 2010. He had been there before on family vacations, but this was my first trip. Actually, it was also my first time in Florida. As a kid I never really went on vacations. I grew up the youngest of 4 with a single mom, so vacations weren’t a top priority. We had moved to West Virginia from Michigan in the 80s, so we often went back to the Detroit area during the summer to visit family. But even that stopped after a few years. When my sister moved to Myrtle Beach, South Carolina I finally got a real vacation. As much of a vacation you can get with staying in your sister’s house and all of your meals coming from the grocery store Food Lion, but I got to see the ocean for the first time when I was 16. I still haven’t been to the Dixie Stampede, but I hung out at the Surfside Pier for a week, and it was a great summer. My other sister had gotten a big fat tax refund one year, and she booked a trip for all of us to stay at Walt Disney World for a few days. We had a room at one of the All Star resorts. I was beyond excited. And then she canceled it. I had forgotten about a Disney for a while until I met my supervisor when I was a student worker in college. She had just gotten back from a Disney vacation. (The nerd that I am, I can still remember where she stayed – the Port Orleans French Quarter Resort.) She showed me a bunch of photos and told me all about it. I was enthralled. She was a Walt Disney World veteran so I got to hear many, many stories of her trips. I was more determined than ever to get there one day. When I met Gary I told him about my dreams of a Walt Disney World vacation. He suggested we take a trip there (before we were engaged), but I thought that it would be more awesome if my first ever trip to the World would be on our honeymoon. So that’s exactly what we did. We didn’t have internet at home at the time (country living) so I remember we booked our hotel room for our Universal Orlando portion using our laptop on McDonalds’ wifi. We had 5 nights at Disney’s Pop Century Resort, followed by 2 nights offsite at a hotel across the street from Universal Orlando. It was the fastest week of my life. Because I spent a lot of time planning our DIY wedding, I didn’t spend as much time planning our honeymoon. I was bitten by the Disney bug so I became an uber planner for our next trip, which was two years later. TWO YEARS LATER. (In all honestly, I thought our honeymoon would be my first and only time there.) In those two years I became Disney obsessed. All I listened to were Disney podcasts. The only things I followed on Facebook were various Disney sites. I couldn’t stop buying Disney related items on Etsy. I learned everything I could. When we finally crossed the entrance to Walt Disney World (Where Dreams Come True) I may have shed a tear or three. And guess where we stayed? Disney’s Port Orleans French Quarter. It remains my most favorite of all of our Disney trips. We’ve now stayed at 13 Disney resorts, been on a Disney cruise, and visited Disneyland for my milestone birthday last year. This year we became Walt Disney World annual pass holders. Disney is definitely my happy place.